Describe the structure of the Canadian legal system including the three branches of government. Define legal terms relevant to the Internet. Describe the differences between civil and common law legal systems, and also between common law and statute. Identify the important facts of a legal case. Identify the most important legal issues. Describe the relevant legal test. Apply the relevant legal test to the facts. Describe how to protect a trade secret. Search online to determine if a trademark is available. Describe how to register a trademark in the Canadian Intellectual Property Office. Describe how to protect a trademark under common law. Identify the rights of two or more entities to a trademark. Select the entity with stronger rights to a trademark. Identify what is copyrightable on the Internet. Describe the legal test for copyright protection on the Internet. Describe how to mark creative works with appropriate copyright notices. Define the legal requirements for an online business method patent. Apply the legal requirements for an online business method patent to a hypothetical situation. Describe how to obtain both geographic and generic domain names. Apply the rules for priority over domain names. Conclude on which entity has priority over a domain name. Describe important clauses in a license agreement for web site content, an Internet access agreement, a web site development contract and a web site hosting agreement. Describe the legal liability for the activities of linking, framing and the use of meta-tags. Identify areas of liability for Internet service providers. Describe the legal test for defamation in Canada and the US. Identify illegal content for web sites. Describe appropriate legal notices for limiting liability for various types of web sites. Select the best causes of action for a particular hypothetical situation. Conclude on the likely outcome of a cause of action. Identify essential components of online contracts. Determine, for a given set of facts, which jurisdiction applies. 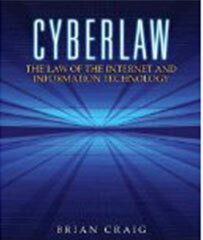 Interested in being notified about future offerings of BLAW 3205 - Internet and IT Law? If so, fill out the information below and we'll notify you by email when courses for each new term are displayed here.